Fender 7 Guitar Case StandThe Studio Guitar Stand Case is slightly larger than a Fender guitar case. Inside is room for several adjustable combinations of up to seven electric guitars. The rack can also accommodate acoustic guitars. Other features include a poodle plush interior and an accessory compartment. Perfect for stage or recording studios. 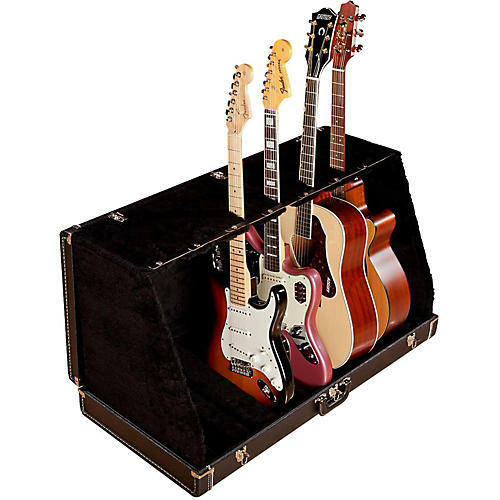 The Studio Guitar Stand Case is slightly larger than a Fender guitar case. Inside is room for several adjustable combinations of up to seven electric guitars. The rack can also accommodate acoustic guitars. Other features include a poodle plush interior and an accessory compartment. Perfect for stage or recording studios.